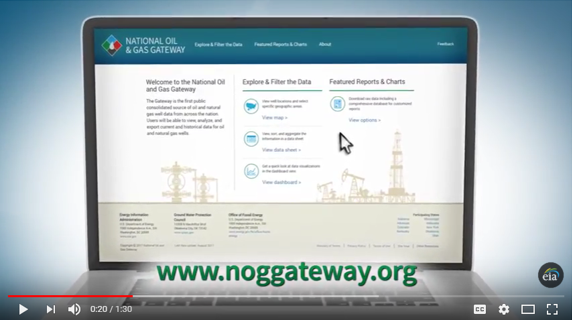 The National Oil and Gas Gateway is the first publicly available website with oil and natural gas well-level data from multiple states. The website was created as a collaborative initiative among the U.S. Energy Information Administration; the Groundwater Protection Council (GWPC) and its member states; and the U.S. Department of Energy’s Office of Oil and Natural Gas, part of the Office of Fossil Energy. Well-level data in the Gateway are updated monthly by the participating states. Ten oil- and natural gas-producing states are currently submitting monthly data to the Gateway: Alabama, Arkansas, Colorado, Kentucky, Mississippi, Nebraska, New York, Oklahoma, Utah, and West Virginia. Participation in the Gateway is open to all oil- and natural gas-producing states, and the GWPC has worked with most of those states to develop the Risk Based Data Management System (RBDMS), a shared data management system developed with the support of the U.S. Department of Energy’s Office of Oil and Natural Gas. Gateway data are available in map, datasheet, or dashboard forms. 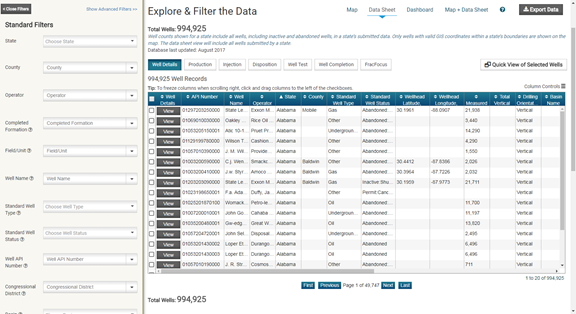 The map view displays the geographic location of wells and allows users to apply filters by drawing areas directly on the map. 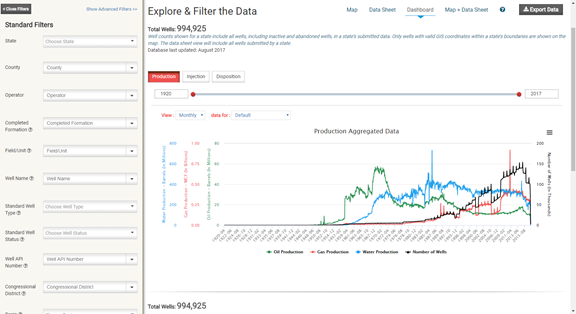 The datasheet displays well data in a spreadsheet format that lets users aggregate, sort, and compare wells, and the dashboard provides charts that can be customized and downloaded. 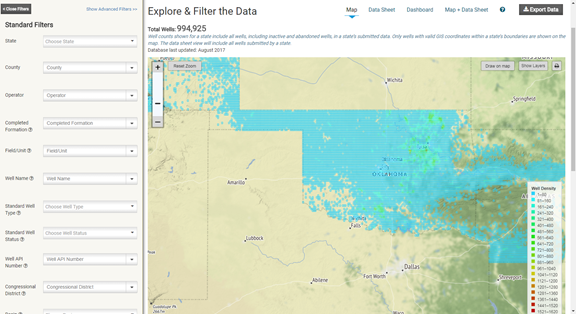 The Gateway combines participating states’ publicly available oil and natural gas data into a common framework with consistent definitions. Before the Gateway, these states’ well-level data were only available on individual state websites or in aggregate in commercial databases. Data in the Gateway can be modified only by the respective states. State agency websites should be considered the definitive source for all data in the Gateway.